January 20, 2018 January 20, 2018 nadinelebeanLeave a Comment on Easy Easy Tomato Soup – Rich, Creamy and Satisfying! Better than Campbell’s! Easy Easy Tomato Soup – Rich, Creamy and Satisfying! Better than Campbell’s! 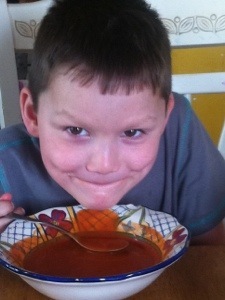 Chaz developed this amazing tomato soup when he expressed his desire for Campbell’s. About our recipe, he says ” It tastes just like store bought but its good for me!”. The tomato paste is rich in lycopene and the broth is healing for digestion. The butter is also very valuable! I’m always looking for ways to get more healthy fats into us. 1. Melt butter in saucepan. 2. Add the rest of the ingredients and heat until hot. Try adding cheese! Or a dollop of homemade yogurt, sour cream, kefir or creme fraiche. What about some herbs like fresh basil or rosemary? Garlic? Previous I Lie To My Children About Food….